Sego Canyon, Combine D (multimedia) by Peter Neibert. 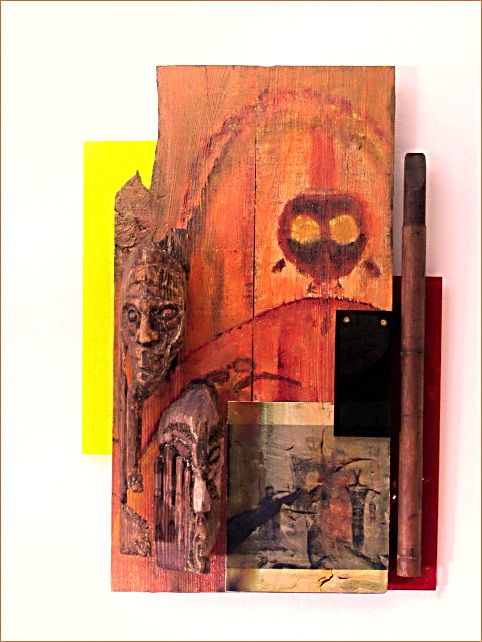 Acrylic on reclaimed redwood, masks carved in fir, pictographic digital photos printed on canvas; carvings in clear Plexiglas behind black layer (stand close). Digital photos by Peter Neibert of Anasazi pictographs (estimated 700-1400 years old) at Sego Canyon, Utah.